On January 16th, Steve Rowland was interviewed by David FitzGerald on Radio Devon (listen from 12:08:32) and discussed his research on ambergris. The interview will be available for 29 days from 16/1/2018. Later that day, he briefly appeared in a piece aired on BBC 1 Spotlight. See 'Whale dung stone' found on Ilfracombe beach for further details on this story. Chemistry World reported on work to unlock the history of Earth’s polar regions by Simon Belt and his colleagues using organic molecules isolated from diatom algae in ice cores. Mike Wilde (left) won the prize for the best presentation at the Environmental & Food Analysis SIG Meeting (EFASIG2015) held in Southampton on 28 October 2015. Mike's presentation was titled "Identification of Petroleum Acids by GC×GC-MS: A New Method Based on an Old Approach" and the prize was presented by Thomas Lambert of ARC Sciences (in the absence of the donor, Simon Lambert). '… Steve Rowland, an organic geochemistry professor at the University of Plymouth, in England, was one of the first scientists to offer assistance. His group had recently successfully identified polyisobutene as the culprit in a massive spill off the coast of the U.K. in 2013. Thousands of birds were killed during that disaster. Polyisobutene’s physical characteristics share many similarities to the California contaminant—sticky, gummy, gluey—led many scientists to suspect it was the culprit. Everyday cosmetic and cleaning products contain large numbers of plastic microparticles, that can be released into the environment when personal care products, such as facial scrubs, are used. The particles are icluded in these products as bulking agents and abrasives. Unfortunately, because of their small size they oftenpass through conventional sewage treatment works and are released into rivers and then the marine environment. Imogen Napper and Dr Adil Bakir (PhD and Postdoctoral Researcher, resepctively along with Professors Steve Rowland and Richard Thompson, published their research in Marine Pollution Bulletin, and estimate this could result in up to 80 tonnes of unnecessary microplastic waste entering the marine environment every year from use of these cosmetics in the U.K. alone. See Cosmetic and cleaning products contain millions of plastic particles for further details and 10.1016/j.marpolbul.2015.07.029 for the full article. Kate Schofield, has created a cost effective and environmentally sustainable soil for the Eden Project. Kate is working on her PhD with Drs Mark Fitzsimons and Alan Tappin as well as colleagues at the Eden Project. Her work has been reported in the local press. PEGG research adorns the cover of the latest issue of Environmental Science: Processes and Impacts. The research by Drs Mark Fitzsimons and Alan Tappin at Plymouth, and colleagues at the Institutive of Integrative Biology at the University of Liverpool, demonstrates that natural photo degradation of diazepam (valium) and similar medicines, followed by bacterial breakdown, may reduce their potentially harmful impact on the UK’s freshwater environment. Diazepam – used to treat anxiety and other similar conditions – has been detected in rivers across the UK and Europe, having been released from waste water treatment plants. At these levels it has the potential to produce harmful ecological effects in surface waters, including changing the behaviour of fish shoals and their ability to sense danger from predators. The study has generated considerable interest and was reported by the American Association for the Advancement of Science, Science Daily and in an industrial publication, Processing Magazine. Our home grown footballing chemist, Charles West, achieves further notoriety in the local newspaper, The Herald, having been chosen as one of the Royal Society of Chemistry's 175 Faces of Chemistry. Charles West has been chosen to be one of the Royal Society of Chemistry's '175 Faces of Chemistry'. Professor Lesley Yellowlees, the RSC's first female president, launched the celebration on 15 October 2012 and it is running for the 175 weeks leading up to the RSC's 175th anniversary on the 23 February 2016. In all, 175 ambassadors and role models for future generations of scientists are being featured and in the last week of August 2014, Charles' unconventional journey into chemistry was celebrated. Well done Charles! 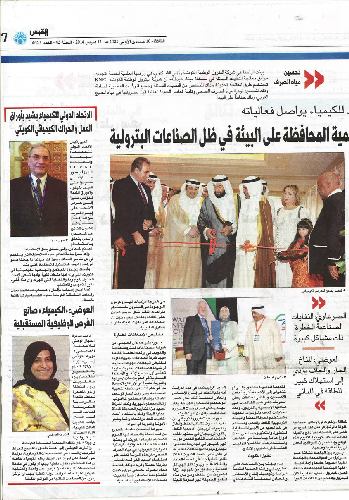 Steve Rowland recently visited Kuwait to present a Plenary Lecture (A hump no more? Identification of toxic unresolved apolar and polar pollutants from hydrocarbon degradation) at the prestigious third Kuwait Conference of Chemistry, which was held 9-11 March 2014 at The Regency Hotel, Kuwait. The meeting was organized by Kuwait Chemical Society (KCS), Kuwait University (KU), Kuwait Institute of Scientific Research (KISR) and Public Authority for Applied Education and Training (PAAET). While in Kuwait Steve was able to catch up with Lulwa Ali, who completed her PhD with him 20 years ago in 1994. Lulwa now works for the Kuwait Institute of Scientific Research and Steve commented that it's great to witness the successful careers of our alumni. Charles West has, yet again, added to his accomplishments having been selected as a judge for the Observer Ethical Awards 2014. Footballer, Research Scientist, Blogger... and Racing Car Driver? Charles West has added to his extensive œuvre by blogging on The Guardian's Higher Education Network. The Group is now saving up to buy Charles a McLaren MP4/4. 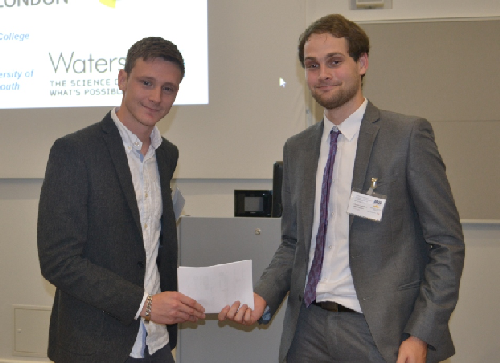 Charles West was announced as the Environmental Science winner of the Scopus Young Researcher UK Awards 2013 at a prestigious event held at the The Energy Technologies Institute, Prince Philip House, London on 14 November 2013. Charles and five other early career researchers were honoured during the Award Ceremony, which was attended by university executives, policy makers, senior researchers, Fulbright alumni and Elsevier top management. The award was developed by Elsevier in association with the US-UK Fulbright Commission and recognises the outstanding achievements of the UK’s early career researchers. The award winners are all researchers, who have published for the first time in 2010 or more recently and have an affiliation to an institution in the United Kingdom. They were assessed by a jury of former Fulbright Scholars based on publication and citation information provided by Scopus, Elsevier's abstract and citation database. Mark Fitzsimons was interviewed on ITV Westcountry on Wednesday 27th March 2013 for comment on the deteriorating bathing water quality in Southwest England, based on the Good Beach Guide published by the Marine Conservation Society. He explained the main reasons for the increased inputs of sewage to SW coastal waters and the options for improving water quality ahead of the revised, and more stringent, water quality levels required under the EC Bathing Waters Directive. Ten years ago, Science and the National Science Foundation launched an international competition to recognize the best examples of projects that bring scientific information to life. In its tenth year, Clare Redshaw and colleagues were the People's Choice winner for their visualisation "The Pharma Transport Town: Understanding the Routes to Sustainable Pharmaceutical Use". The authors are Will Stahl-Timmins, Mathew White, Michael Depledge, and Lora Fleming from the European Centre for Environment and Human Health, University of Exeter Medical School and Clare Redshaw from the University of Plymouth. The achievement was reported in Science and the team are hoping to use the graphic as an educational tool to help understanding of the issues, for scientists, policy makers and the general public. Steve Rowland and Paul Sutton have analysed the material found on guillemots and razobills washed up along the coast of South-West England. Using high temperature gas chromatography as well as gas chromatography-mass spectrometry they have determined that the sticky, semi-solid substance is polyisobutene (PIB), which is used as an additive in oils to improve performance. Reports on the BBC News and Science & Environment pages show Paul extracting and analysing the material from a dead guillemot, while Steve explains more of the details behind the investigation. The work has also been reported in local and national newspapers. As they say, now it's a search for those responsible. Go West! ...or is it East? Charles West has been awarded a Royal Society of Chemistry JWT Jones Travel Fellowship. Charles will visit Monash University (Melbourne, Australia) from January to March 2013 to collaborate with Professor Philip J. Marriott. The aim is to develop microscale preparative two-dimensional gas chromatography (prep-2D GC) with NMR spectroscopy to isolate and identify major individual chemicals from ‘supercomplex’ OSPW samples and sub-fractions. Tom Brown and Ashleigh Ringrose returned from a cruise to Svalbard where they travelled to 82°N on a ship with ice-breaking capabilities. They collected a range of organisms such as star fish, sea cucumbers, urchins, polar cod, crabs, sponges, amphipods and shrimps. The specimens will be used to study sea-ice primary production, which they hope will provide a greater understanding of climate change. One of the highlights was venturing onto the frozen sea-ice to collect ice samples when they had to look out for polar bears but downsides included rough seas and sea sickness. They hope to return to the area in the summer to collect additional samples. The trip was featured in the local press (Icy Wastes Teem with Life and Scientist off to the Seas of Ice). "Investigating whether microplastics cause harm in the marine environment" is the prosaic title of a ca £400,000 award to Professors Richard Thompson (MBERC), Steve Rowland (PEGG) and Tamara Galloway (University of Exeter) by DEFRA recently. Won competitively, in awarding the grant DEFRA noted that "... liked the coverage of research topics, your understanding of the MSFD, the scientific equipment immediately available to you, the added strength built in with your choice of research partners and of course your reputation in this field ...". Not content with award for Best Research Team (below) BGC and PEGG in particular were delighted when Professor Simon Belt was awarded a National Teaching Fellowship for 2010, making Simon officially one of the best teachers in HE chemistry in the U.K. Simon received the award from Professor Shirley Pearce, Chair of the Advisory Panel, at a Gala Dinner held at Middle Temple Hall, London, on 29th September. The award comes with a certificate and £10,000 to spend on "professional development". 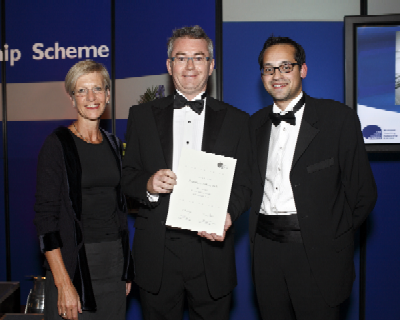 The Biogeochemistry Research Centre (BGC) comprising a merger of the BEACh and PEGG research groups, was awarded the prestigious Vice Chancellor’s Award for Best Research Team 2010 at a recent "Oscars"-type grand night in the Graduation Marquee on Plymouth Hoe. BGC Co-Director Professor Steve Rowland and PhD student David Jones suitably "bibbed and tuckered" were selected and honoured to receive the award from Pro-VC Professor Julian Beer, on behalf of all hard-working members of BGC. Well deserved... let's do it again this year! Professor Simon Belt has been awarded a 2010 National Teaching Fellowship by the UK Higher Education Academy in recognition of his commitment to excellence in the teaching of chemistry in higher education. As part of the award, Simon will receive £10,000 to 'invest' in his professional development – first stop, an academic gown, an iPAD and a holiday conference or two. Simon will officially receive his Fellowship at a gala dinner in London in September – Cheers! Dr Alan Scarlett of the Biogeochemistry Centre has recently been awarded a fellowship by the Japan Society for the Promotion of Science (JSPS) to carry out cooperative research at a leading Japanese research institution. The JSPS awards up to 25 fellowships per year from all fields of science including computer, engineering, health, biological, life, natural and physical sciences, mathematics, humanities and social sciences etc. Alan will spend three months based at the Institute for East China Sea Research, Nagasaki University, conducting collaborative research with Dr Awantha Dissanayake under the supervision of Professor Atsushi Ishimatsu. Alan and Awantha both studied for their PhDs within the UoP's Marine Ecotoxicology Group and have previously collaborated in a study into the effects of toxic compounds when transferred from prey to predator (Scarlett et al., 2009 [Environmental Toxicology and Chemistry 28, 381-387 doi: 10.1897/08-298.1]). The new research project "Assessing the Health of Japan's Marine Environment: An Integrated Biological and Chemical Approach", will make use of the Biogeochemistry Centre's new state-of-the-art tandem chromatograph-time-of-flight mass spectrometer (GC×GC-ToF-MS) which has the power to separate and identify thousands of previously unidentified chemicals. As well as providing novel insights into marine pollution within Japan's coastal regions, the research will provide additional data for Professor Steve Rowland's European Research Council funded project "Overlooked Unresolved Toxic Organic Pollutants: Resolution, Identification, Measurement and Toxicity (OUTREACH)". Continuing their quest to obtain sea-ice from every available source, Simon Belt and Tom Brown have teamed up with polar explorer Antony Jinman. In February 2010 Antony and his team will attempt to ski to the Geographic North Pole and along the way they'll collect samples of algae from the sea-ice over which the team will travel (as if they don't have enough to do already!). The samples, once brought back to the laboratory, will provide invaluable data for our research into the extent of past sea-ice. Dr Guillaume Massé and Professors Simon Belt and Steve Rowland (all members of the Biogeochemistry Research Centre and Petroleum and Environmental Geochemistry Group) have been awarded €448,604 from a total > €3million for an EU-funded project - CASE: The Changing Arctic and Sub-arctic Environment - which is a research and training programme on marine biotic indicators of recent climate changes in the high latitudes of the North Atlantic. This project is funded under the EU Framework 7 Programme Marie Curie Actions Initial Training Networks. The main aim of the project is to train the next generation of European palaeoclimate scientists in marine biotic proxies and modelling of past climate changes. The €3,069,277 award will support 12 PhD students, two of whom will be registered at the University of Plymouth in the newly approved Biogeochemistry Research Centre which is to be co-directed by Professors Paul Worsfold and Steve Rowland. Partner institutions in the project are the Universities of Amsterdam and Tromsø and institutes in Paris (CNRS), Germany (IFM Geomar) and Norway (Geological Survey). Professors Belt and Rowland will give specialist courses in geochemistry proxies to all 12 of the students in Plymouth, whilst the Graduate School will provide more generic research skills training. Simon Belt will be giving an invited lecture at the forthcoming 2009 Fall Meeting of the American Geophysical Union in San Francisco, U.S.A. (14-18 December 14-18 2009). The meeting will be attracting leading palaeoclimate scientists from around the world, and Simon will be presenting at a session entitled: Take it From the Top: Climate Variability in the Arctic and Sub-Arctic During the Holocene. The first part of Simon’s presentation title ( ... the middle and the bottom ... ) may take a little working out! PEGG’s most recent Arctic research work has recently been published in Nature Geosciences (doi: 10.1038/ngeo665). Working alongside Professor Ruediger Stein and PhD student Juliane Mueller from the Alfred Wegener Institute for Polar and Marine Research, Germany, Simon Belt and Guillaume Massé have reconstructed a sea ice record for the northern Fram Strait region of the Arctic for the last 30,000 years. The study site is a major gateway between the Arctic and the northern North Atlantic Oceans and represents a pivotal location for investigating past climate change. One of PEGG's PhD students, Kevin Thomas, has featured on Schrodingers Katt, a popular science TV show in Norway (unfortunately the program is now off-line). Kevin completed his PhD in 1995 under the supervision of Steve Rowland having worked on Characterisation and environmental effects of unresolved complex mixtures of hydrocarbons and now heads up the Ecotoxicology and Risk Assessment Unit at NIVA, Norway. We're wondering if this signals a change of career for Kevin! First year PhD student, Naomi Downes-Tettmar (co-supervised by Dr Carole Llewellyn, Plymouth Marine Laboratory and Professor Steve Rowland, PEGG), featured on BBC TV and radio in August when a red tide of toxic algae killed fish in St. Austell bay. Naomi’s research project, funded by the Natural Environment Research Council, aims to develop chemical analytical methods for assessing the levels of algal toxins such as domoic acid, in seawater. In association with Dr Neil Chilcott of Kernow Analytical Technology Ltd. Dr Paul Sutton was a runner-up in the University of Plymouth Business Ideas Challenge 2009 competition and received £1000 in cash to develop our idea for "Thermal Separations" plus professional and service support packages worth up to £2000. Heavy rain in the summer of 2007 washed large amounts of nitrogen into the English Channel, causing algal blooms and changing the function of marine phytoplankton, according to new research published by Dr Mark Fitzsimons and others in Estuarine Coastal and Shelf Science (10.1016/j.ecss.2008.12.005) and discussed in NERC's PlanetEarth (see Storm Nutrients Disturb Plankton Populations). The research has also been featured in the local press (Heavy Rain 'May Harm Sea Life'). PEGG Senior Scientific Officer, Dr Paul Sutton and industrial collaborator Dr Neil Chilcott of Kernow Analytical Technology Ltd. were awarded a Highly Commended citation at the first round of the 2009 regional Business Ideas Challenge hosted by the University of Plymouth on Friday night for their idea "Thermal Separations". A further two rounds of competition will take place before March when the 16 winners from the first round will be narrowed down to the eventual winners. A Sticky Problem and a Search for Enterprising Solutions! 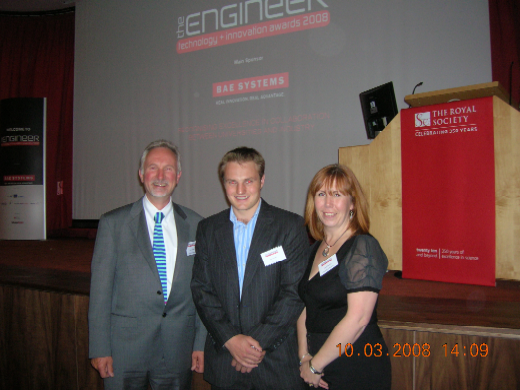 Professor Steve Rowland (Petroleum and Environmental Geochemistry Group, SEOES), Dr Susan Boulton (Research and Innovation) and Dr Ben Smith (Oil Plus Ltd.) attended a presentation event at the Royal Society in London on Friday 3rd October, as finalists in the Technology + Innovation Awards of The Engineer magazine. Founded in January 1856, The Engineer is among the world's oldest professional journals, but is a comparative newcomer compared to the Royal Society which is celebrating 350 years! The awards were hosted by the BBC's Rory Cellan-Jones. 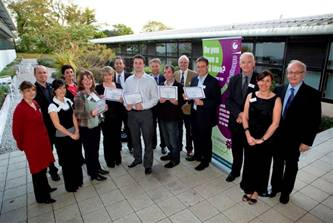 Other finalists were Cambridge University and the eventual winners in the 'energy' category, Southampton University. The Plymouth team have been working with technologists from Oil Plus Ltd. of Newbury to solve an oil industry problem of pipeline blockages and corrosion of pipes caused by organic chemicals called naphthenic acids. Identification and isolation of the compounds by Professor Rowland's research group PEGG, in collaboration with Oil Plus and scientists from a Norwegian university also led to the winning idea for the 2007 Business Ideas Competition reported previously and most recently to an award of £250,000 to PEGG from BP, Total, Chevron, Nalco and BG Group to further investigate the problem. Scientists from the sponsoring companies arriving from Houston, Bangkok, Pau, London and Aberdeen attended a two day meeting opened by Professor Richard Gibb, newly appointed Dean of Science at the University. How's that for enterprise! PhD student, Richard Johnson, won the best student poster award at the Society for General Microbiology 163rd Ordinary Meeting held 8-11 September 2008 at Trinity College Dublin. Richard, who works with Corinne Whitby in the Department of Biological Sciences, University of Essex and is co-supervised by Steve Rowland in PEGG, presented the poster titled "Molecular characterisation of 'aromatic naphthenic acid'-degrading bacteria". Steve Rowland has been awarded €2M (over £1.6M) by the European Research Council for an "Advanced Grant". These grants are intended to support "exceptional established research leaders to pursue frontier research of their choice. They aim to encourage risk-taking and interdisciplinarity, and support pioneering frontier research projects". This research will focus on the characterisation and toxicity of forgotten pollutants resulting from crude oil pollution. Steve said "I hope this will be a real boost for the members of the Petroleum & Environmental Geochemistry Group, both past and present, who have worked so hard to conduct world class research at Plymouth, often under challenging conditions. I would like to thank them all for putting PEGG on the scientific map of Europe. This promises to be a really exciting project and I look forward too, to further collaborations with colleagues in the EU and beyond." Guillaume Massé has been awarded almost €1.9M (over £1.5M) by the European Research Council for a "European Starting Independent Researcher Grant". These grants are intended to support up-and-coming research leaders to start conducting independent research in Europe. 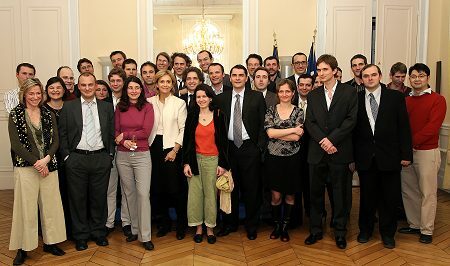 Guillaume (shown here, far left back row, with Valérie Pécresse, fourth from left front row, currently French Minister of Higher Education and Resarch) will use the award to fund a number of research scientists and equipment within PEGG over the next five years. This research will focus on algal metabolites in the marine environment, particularly in polar regions, and their use as proxies for investigating climate change. Guillaume's success has been reported locally in the The Herald ("The Iceman Cometh"). Simon Belt participated in "The Last Polar Bear Project", which culminated in an evening event at Coombeshead College, Newton Abbot, Devon on Thursday 27 March 2008. The students showcased their "digital shorts" and Simon was amongst four distinguished guests who spoke on a range of environmental issues including climate change, recycling and resource management. The event was a huge success with both students, presenters and sponsors alike and was reported in the Herald Express (Torquay) (Students Showcase Work on Climate)! Tom Brown is currently in the Arctic on Canadian Coast Guard Ship (CCGS) Amundsen and his adventures and research were featured in the Toronto Star on 23rd March 2008. In the article (A week's Worth of Science News), Tom's work studying the C25 highly branched isoprenoids is described and its importance in understanding past climate change highlighted. Tom has also posted a dispatch, which gives more detail. Booth, A., Sutton, P.A., Lewis, C.A., Lewis, A.C., Scarlett, A., Wing Chau, Widdows, J. and Rowland, S.J. (2007) Unresolved complex mixtures of aromatic hydrocarbons: Thousands of overlooked persistent, bioaccumulative and toxic contaminants in mussels. Environmental Science and Technology 41, 457-464 [doi: 10.1021/es0615829]. Cooking up Interest in Chemistry! Staff in the Centre for Chemical Sciences (CCS) at the University of Plymouth held a Chemistry Taster Day for prospective students (those who have applied for September 2008 entry) on Saturday 26th January. 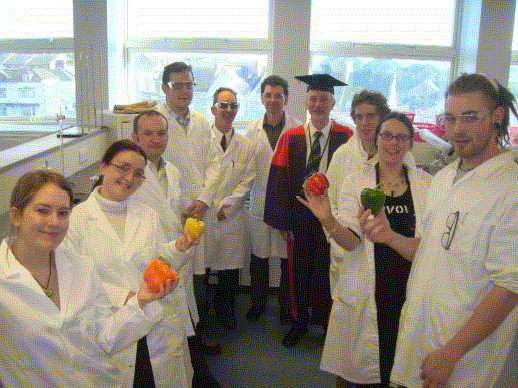 After a welcome lecture to applicants and parents from CCS Head Steve Rowland, wearing full academic gown and mortar board, in the new university LABPlus facility, the students conducted a typical undergraduate experiment to determine the concentrations of vitamin C in green peppers. Faced with a fictitious but realistic scenario in which they were asked by the Food Standards Agency to conduct the analyses, the students had a unique opportunity to compare the effects of microwave cooking, boiling and baking on the vitamin C content of the peppers. It seems "fresh is best"! The staff chose this experiment since it reflects the "hands-on" flavour of teaching at the university, which has made Plymouth chemistry graduates so employable. Bristol school pupil Jessica commented "it was a great day and gave me a real insight into what is expected at undergraduate level". Giles, who travelled from Poole in Dorset, was equally complimentary, saying "it was well worth the early start from home and the staff were very friendly and helpful". Mike Foulkes and Anthony Lewis, who supervised the experiments with technicians Andrew Tonkin and Andy Arnold, reckoned it was a Saturday well spent! Steve intends to make the day a regular event "very few people even know we teach chemistry at Plymouth", he said, "as we are very small compared to our competitors, but an event like this helps those who have discovered us, to make up their minds in an informed way about where to study chemistry at university". Head of PEGG, Steve Rowland was awarded first prize at the regional Business Ideas Challenge hosted by the Tamar Science Park in Plymouth last night. Steve’s patented idea, to turn exotic chemicals isolated from petroleum waste into drug delivery agents, met with wide acclaim from the judges. The award followed three rounds of competition in which the original 77 applicants were narrowed down to the eventual winners after a Business Plan Competition and a Dragon’s Den round where the budding entrepreneurs presented their ideas to a panel of regional business men and women. Steve’s prize was £2,500 in cash, plus introductions to a range of venture capitalists and prospective sponsors. Steve now plans to set up a company 'Lipoil', to produce the chemicals on a larger scale at the Tamar Science Park and hopes to sell the products for use by the pharmaceutical industry. On 11th December 2007, Simon Belt gave a presentation at a public meeting to celebrate International Polar Year, at the University of Plymouth. The meeting, which also featured talks by Dr Jason Hall-Spencer and Professor Laurence Mee as well as the UK premier of the climate change film Silent Snow, by award-winning Dutch film maker Jan van den Berg, was reported in the The Herald ("Meltdown") and the Western Morning News ("Scientists to Share their Climate Change Stories" and "I've see the Polar Ice Cap Melting Fast"). Three intrepid members of PEGG (Simon Belt, Guillaume Massé and Lindsay Vare) have been floating around the North-West Passage in the Canadian Arctic during October and November as part of the the Canadian ArcticNet consortium. Their exploits have been reported on the BBC Ten O'Clock News (e.g. see "Polar Bears in the Arctic Region") and on the BBC website ("Arctic Muds Reveal Sea Ice Record" and "Northwest Passage: Your Questions Answered"). More locally in Plymouth, the Western Morning News ("Ice Research May Help Predict Climate Change") reported on their research. Following the publication by Emma Teuten and colleagues in Environmental Science & Technology (DOI: 10.1021/es071737s) that small pieces of plastic could transport hydrophobic pollutants quite a media storm has resulted. News of the research has been reported in The New York Times, New Scientist, LiveScience.com, The Naked Scientists, 11thHourAction.com and physorg.com... of course there are probably more we've not yet found out about! The publication of some of our research into plastics pollution in Science (2004, vol. 304, p. 838) met with world-wide interest including an interview given in December 2006 by our MBERG ecologist colleague Dr Richard Thompson to the BBC Ten O'Clock News and Costing the Earth (8 December 2006) on BBC Radio 4. The PEGG members were delighted to be awarded over a million pounds of research grant funding between September 2006 and January 2007. These comprised three awards totalling £680,000 from the UK Natural Environment Research Council (NERC) to Professors Simon Belt and Steve Rowland and Drs Guillaume Massé and Mark Fitzsimons and not to be outdone, Dr Anthony Lewis and Professor Steve Rowland were also awarded £300,000 from the UK Foreign & Commonwealth Office and over a further £100,000 from industry and the UK government Knowledge Transfer Partnership. Simon Belt winner of the Royal Society of Chemistry Higher Education Prize for 2003 gave his inaugural Professorial lecture to a full Stonehouse lecture theatre on 15th March 2006 entitled "Chemical Conundrums and Climate Change: From Margarine to Margaritas". Introduced by the Dean of Science, Professor Roddy Williamson, the lecture attracted half a dozen polar bears and starred an imitation of Catherine Tate's stroppy teenager character in full-on "am I bovvered" mode! PEGG were delighted to occupy their newly re-furbished £1M laboratories recently – especially when polar explorer, Pen Hadow (pictured right) kindly agreed to open the labs. The new labs, which include the latest facilities for conducting experiments on climate change at minus ten degrees Celsius, were described by Pen as “outstanding”. Pen talked about his fears for the consequences of global warming which he observed for himself at the North Pole, where sightings of mother polar bears and cubs were clear indications of the increasing extent of ice-free water at the pole. He met and talked with diatom specialist, Dr Guillaume Massé (pictured left) about Guillaume's plans for using sea-ice algae as indicators of past climate change. Guillaume recently also returned from the Arctic, along with Professor Simon Belt. The two PEGG scientists conducted sampling studies of polar sea-ice with Dr Michel Poulin of the Canadian Museum of Nature and other members of the Canadian ArcticNet consortium. PEGG research on oil pollution was featured in an article by Nicola Jones in New Scientist magazine ("Spills' Lethal Legacy Lives On"; 5th April 2003) and also on BBC Radio 4 Costing the Earth on 17th April 2003, when Steve Rowland and Emma Smith were interviewed about their research into oil pollution by presenter Tom Feilden.